Kale and celery are both alkalinizing (which means that prevent things like cancer and premature aging!) The sunflower seeds add additional protein, major fiber, calcium, magnesium, the list goes on! 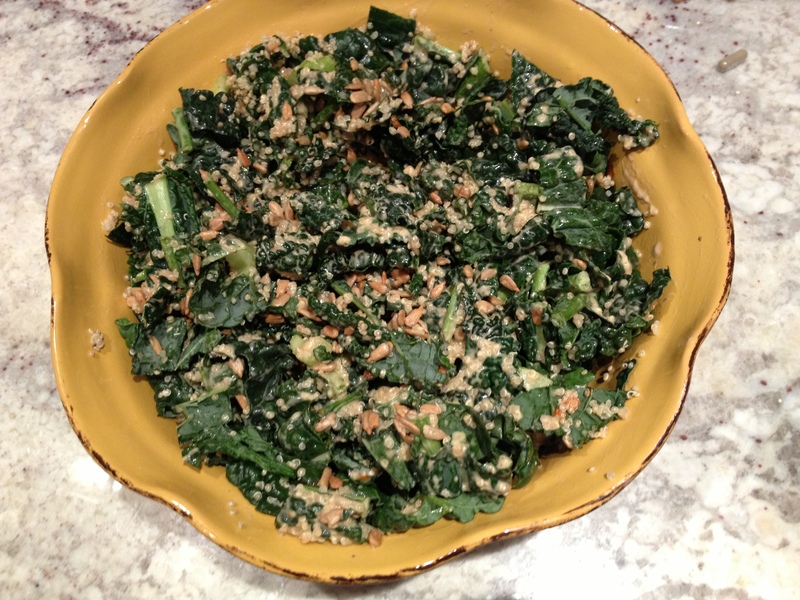 I dared to take this healthy dish as an appetizer to a party where I knew only the host, and I’ll tell ya’ it was a hit! The gals there were eager to score the recipe, so, Ladies of Lapaloma Lane, this one’s for you! In a small pot add 1 cup of quinoa (or bulgur, barley or faro) and 2 cups water, bring to a boil, then simmer until water is gone. Add cooked quinoa to salad bowl and cover with a towel. The warm grain helps steam the coarse kale. Salt and pepper to taste and mix thoroughly. Serve Warm or cold. And prepare for a fan club or recipe requests! Keeps in fridge all week.